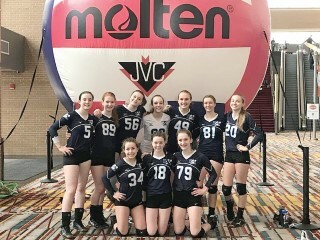 The 16 National Team from Maine Juniors Volleyball Club went undefeated this weekend at the New England Regional Qualifier Tournament in Springfield, MA. They are now ranked fifth in New England going into the club season. The captains of the team are both from Windham, Megan Fleck and Morgan Proulx. Fleck and Proulx are currently sophomores at Windham High School and play on the Windham Varsity Volleyball Team in the fall.